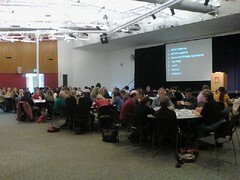 Last week, I had the opportunity facilitate a "Social Media Strategy Map" workshop for over 100 Bay Area nonprofits. The workshop was hosted by Compasspoint, with support from the Lucile and David Packard Foundation. I don't get an opportunity to do this workshop with a large group, so this was fabulous learning experience to work out some techniques to make it scale. And they worked! I wanted to capture a couple of reflections on the process as well as content learnings by way of this post. One of the things that is essential to good instruction (or presentation) is knowing your audience. Every time I present or facilitate a workshop, I review the web sites and social media ant trails (social media properties) of participants. This takes a lot of time because I'm not just browsing, but I'm doing a pattern analysis for best practices that I can incorporate into a presentation about social media principles and nonprofits. I think people are more likely to pay attention if they know that they might in the presentation. Also, it allows for a more interactive discussion because participants can share their knowledge. 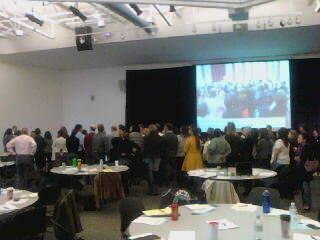 It's a shift from sage on the stage instruction to honoring the learners for what they know. The Bay Versus the Bay: This was an excellent example of how social media strategy can support behavior change or action. Some really good design points. For example, note their call to action right on the YouTube video. They were able to share some insights about how they track the success of this effort. ACLU-Northern California: They are recruiting for a social media intern on Facebook. They used "tagging" on Facebook to make people aware of the note. The note itself is an excellent job description for a social media intern. This prompted a thoughtful discussion about to effectively manage social media interns. The Valley Medical Foundation: This organization provided an example of the personal versus organizational voice issue that social media often brings up. They shared how they worked through this internally. I was lucky enough to be working with good folks at Compasspoint (Nelson Layag, Sue Bennett, and Sierra Catcott) who are experienced facilitators and workshop leaders. They brought along their chimes which are a great tool for getting people's attention when they are working in pairs or small groups. My son lent me his Robot Voice Disguiser which was good for an opening laugh, but the chimes were preferable. It makes me wonder about the various techniques for getting people to shift attention from small group to large group. I've done this game enough times to know that one key to success is making sure the small groups have people with knowledge of communications plans, hands-on experience with the tools, someone who can facilitate the discussion, and people with hands-on experience using the tools. I've used a couple of techniques to accomplish this and they worked. Using a google form, I sent a pre-survey that asked detailed questions about social media experience, communications planning, budget size, and job role. On the name tags, we indicated people with social media experience with a "T" and those with communications planning experience a "C." We made sure that these folks were not all seated at the same table - having them spread their experience through the room so there was a C and T at each table. I also created a stand up, sit down exercise. One part included having people stand if they had a formal or informal communications plan/strategy (half the room) -and then had them sit down in waves to determine formal communications, Internet strategy, and social strategy. There were only a handful of people who had a formal communications plan with a social media strategy. Next, to ensure that all the people who very comfortable with social media aren't seated at the same table, we did the spectra gram. I learned this technique from Allen Gunn who uses it during Penguin Day. I have people line up from "very comfortable" to "not so comfortable" and facilitate a conversation. Then, had them count off by table numbers. Wikitation: A wikitation (word coined by Allan Levine, Cogdog Blog) is a wiki that you use to share you presentation slides and links. I used the wiki to take notes and add resources on the fly that come up during Q/A. The wiki becomes an electronic flip chart and resource collector. What's nice is that allows you save paper and be a little bit green, although you do need a couple of key paper handouts (instructions/cards). The wikitation for this workshop is here. What's the Hash Tag? With more and more people tweeting, I announce at the beginning what the hashtag is and encourage workshop tweeting. I've be using a tool called "What the Hash Tag" that easily aggregates tweets into a transcript. Monitoring the tag stream during the workshop provides a backchannel for people in the room and allows for remote participation. 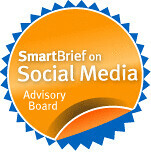 As my own learning and thinking about social media and nonprofits has evolved, so have the principles and strategies. This has had an impact on the design of the cards, game instructions, etc. I spent a lot of time last week tweaking the point system on the tool cards to guide better strategy decisions. It worked, but the strategy framework itself needs to be rethought. The first iteration of the strategy cards consisted only of online approaches and was scaled based on amount of time (listening, participate, share story, generate buzz, and online community building). The tools aligned to the components. I've evolved this to engage/listen, social content, spreading buzz, movement building, and offline impact and more fluidity in choice of tools, also adding new ones. A concept framework for strategy could be tweaked further and I have some ideas. We had enough time so we could use the "life happens" cards where groups lose or win points based on a real life situation. You know, resistance, staff turnover, lack of resources, etc. The groups were thrilled to win points. So, it is making me think that I need to revise the "life happens" to win points if they solve the problem in their strategy. With such a large group, I thought ten reports using the same scenario would be deadly boring. So, we had three scenarios and 3-4 tables working on each scenario. I did the reports out for each scenario which worked really well. People really got into the making up the context part. For example, one of the organizations all of sudden had a famous rap star alumni who made YouTube videos for the organization's campaign. What was a best practice or innovative idea and acknowledge it? Ask a strategy question about something that was missing? What specific how to resource would be useful to know about? Is there a tactical tip to share? All in all - I can say that I learned a lot and hope participants did too! Great post and I keep seeing the techniques as having value in many different presentation scenarios including one on change management I'm putting together. The wikitation is one of the best and I look forward to exploring. Great stuff... not for profits have so much to gain from using social media... it allows them to mobilise a lot of people to work together, hopefully for social good. Thanks for sharing your learning experience - I made some notes for the next time I lead a large workshop. Back to social media content. Reading through the slides made me realize that I don't have a good idea about how to share what I'm hearing in my listening project with other managers/our exec dir. Do you have an earlier post about that or could you write one?